After the first treaty of Fort Laramie a delegation set out from the council grounds on September, 23rd 1851. According to Father De Smet eleven chiefs and subchiefs of Sioux, Cheyenne and Arapaho were to go to Washington. In their company was also agent Thomas Fitzpatrick, former and famous mountain man. Other sources speak of 19 delegates, adding some Oto and Iowa chiefs. Anyway, they stayed in Washington from November 1851 to January 1852, met President Fillmore and did some sight-seeing. Some daguerreotypes were made during their stay, possibly by Philadelphia photographers like James E. McClees or Marcus Aurelius Root, and later copied by Antonio Zeno Shindler. Although these names were given, it is not certain that they are all correct. The Cheyenne Rides on the Clouds is of course Alights-on-a-Cloud, the famous warrior who died shortly after his return to the Southern Plains by a Pawnee arrow. But Little Chief, also a Cheyenne, is listed as a Sioux. He is in the famous photo together with White Antelope and Alights-on-a-Cloud. The Arapaho names seem correct, although Tempest is better known as Storm. I wonder if all Sioux names are!? Now on to my questions. I know the portraits of the Cheyennes, Friday and Goose. Are there more? 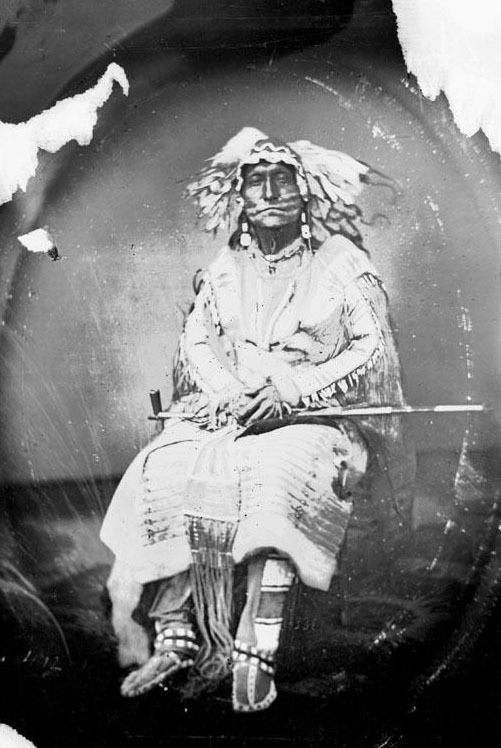 There is also a photo of Red Plume, a Blackfoot Sioux, from the same delegation. He is not listed by De Smet. 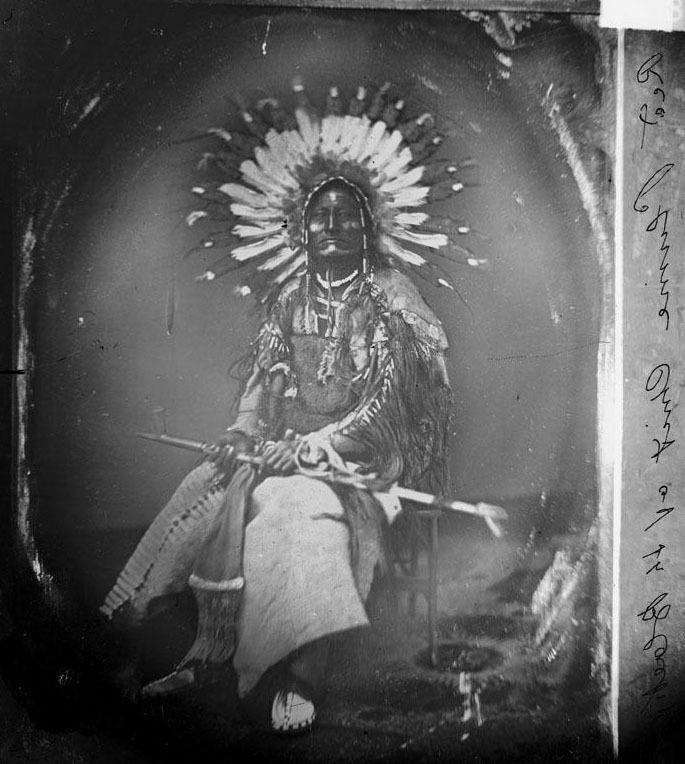 I doubt that this name is correctly identified because in another photo, usually identified as Big Rib, an Oglala, you see that both pictures show obviously one and the same individual. Which name is the right one? To me it is obvious that it is the same man as in the Red Plume photo, whatever his name may be. Look at the unusual headdress and the decoration of the war-shirt. Finally, on their way to Washington, the delegates stopped at St. Louis. Here they were photographed the first time. Two portraits (of the Cheyennes) are in Powell's “People of the Sacred Mountain”. A group photo is in Remi Nadeau´s “Fort Laramie and the Sioux”. of the Jesuits at St. Louis University. find it in what we had here. I hope that this helps. Many thanks to Sandra Lowry for answering my e-mail. 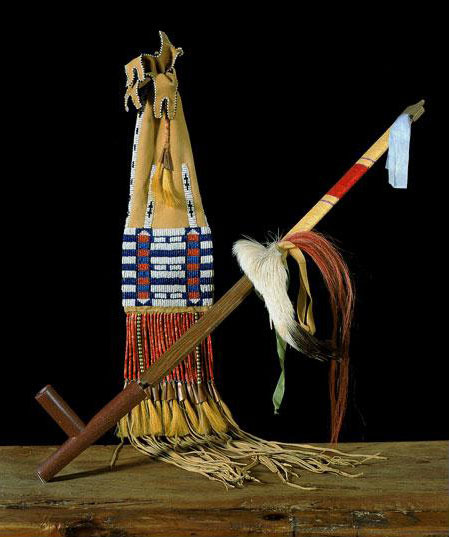 Friday is definitely the one far left, so the order of the Arapaho is somewhat twisted. White Fawn is more likely White Antelope and Mounts the Clouds is just another interpretation of Alights-of-the-Clouds. 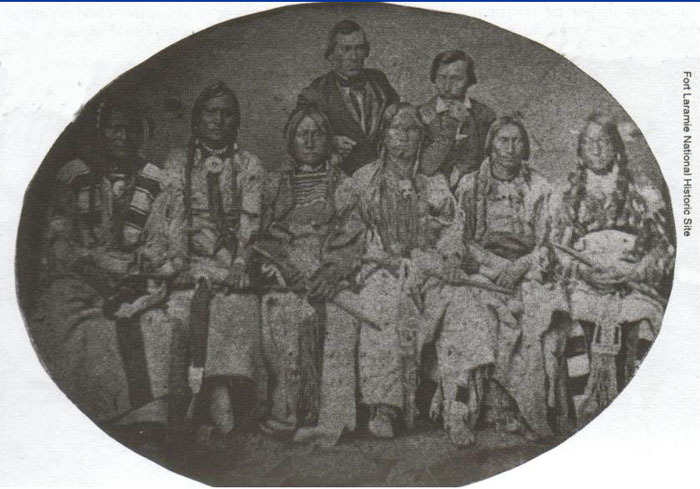 I think Little chief is the second from left, take out the warbonnet from the other photo and you'll see, plus the white necklace. Those men are mixed, one arapaho one cheyenne one arapaho one cheyenne one arapaho one cheyenne. 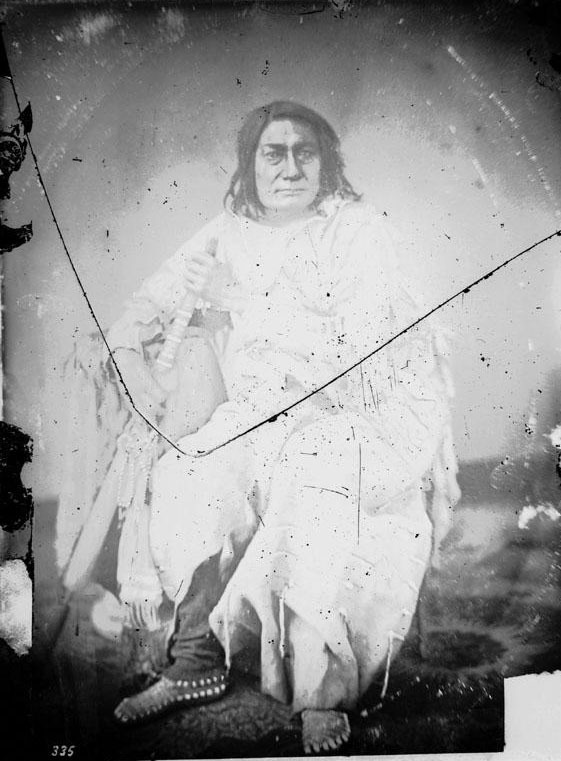 Little Chief (Southern Cheyenne) is not missing; Father DeSmet called him also RED SKIN and told that he died in 1858. Then, Little Chief and Red Skin are the same person. 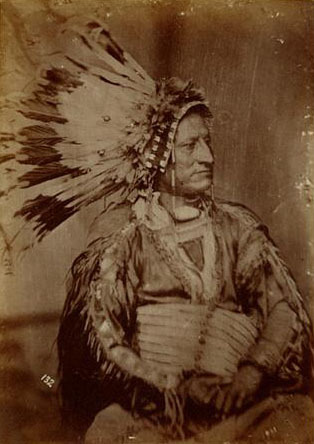 Eagle Head was mentioned by Powell in 1866, when he and Black Coal ware leading the Arapahoes in the fights around Fort Phil Kearny and especially in the Fettermann fight. Eagle Head had a son of the same name, who later was also a headman of the Northern Arapahoe and was closely associated with Black Coal and Sharp Nose. There also was a Southern Cheyenne chief by that name. 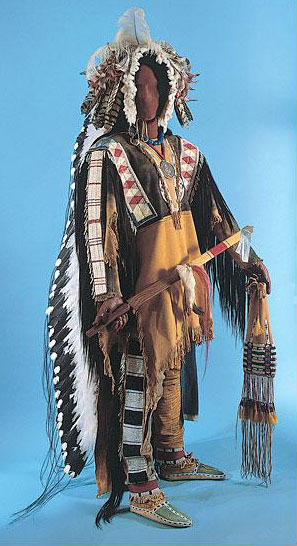 Storm or Tempest was a fellow chief of Little Raven, the most important chief of the Southern Arapaho. 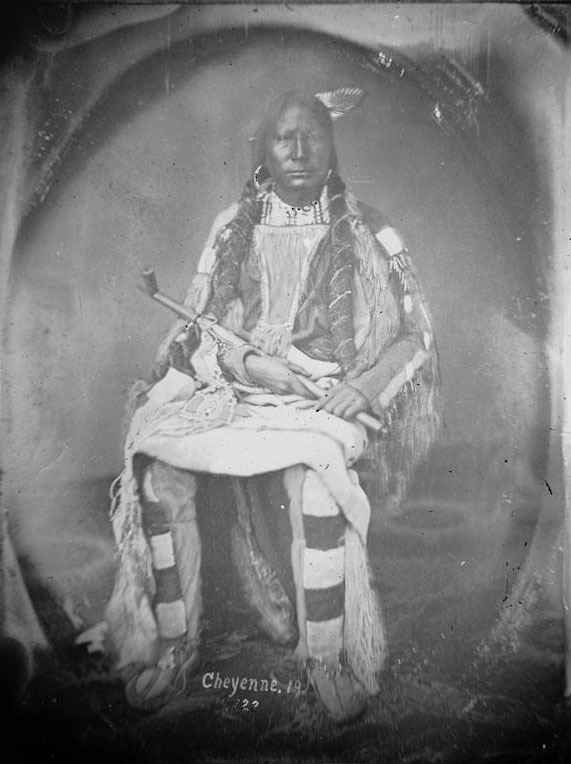 He fought with an allied force of Cheyenne, Arapaho and Kiowa against the Shawnee and Pawnee in 1854. He signed the treaty of Fort Wise in 1861. Camping alongside with Little Raven, he prevented to be at Sand Creek in 1864. In 1865 he signed the Treaty of the Little Arkansas and in 1867 the Treaty at Medicine Lodge Creek. 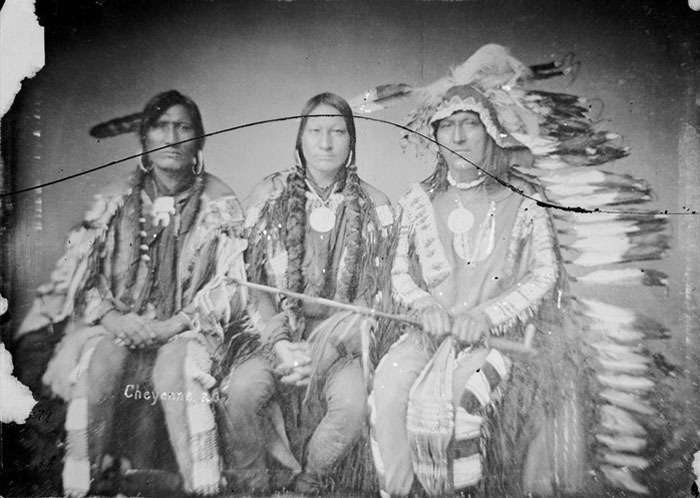 May be this is the definitive collocation of the Indian's Chiefs in the image "Delegation of 1851/52"
From L to R: FRIDAY (N. Arapaho) - LITTLE CHIEF (S. Cheyenne) - EAGLE HEAD (N. Arapaho) - WHITE ANTELOPE (S. Cheyenne) - STORM (S. Arapaho) - ALIGHTS ON A CLOUD (S. Cheyenne). Copyrighted Shindler in 1869, but it looks like it belongs with the series Dietmar's posted above. There's also a photo of one of the Cheyennes (I forget who) and Lola Montez, who was in New York in 1851. That would be Alights-on-a-Cloud. He and High/Big Toe must be the same man. These 1851 photos are all pretty much confused... The photos that Grahame posted as Horned Elk and Big Toe are the ones mentioned above as published in "People of the Sacred Mountain". Powell identified Horned Elk as Little Chief and Big Toe as Alights-on-a-Cloud. If you compare the pictures with the group photo of the three Cheyennes this makes sence. Their clothings look the same. 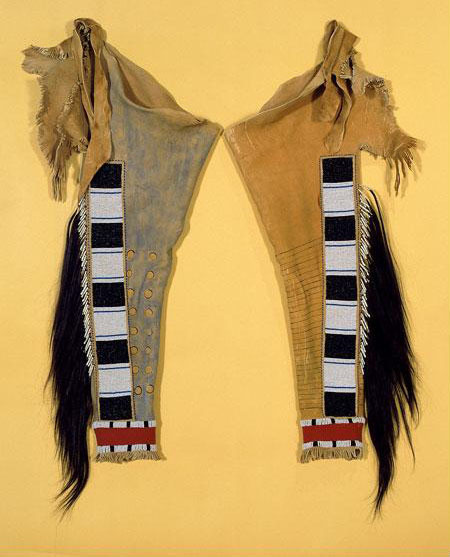 Cathy A. Smith, an artist from New Mexico, who made the costumes for the NA actors in "Dances with Wolves", also reproduced some regalia and clothing of historical indian leaders. 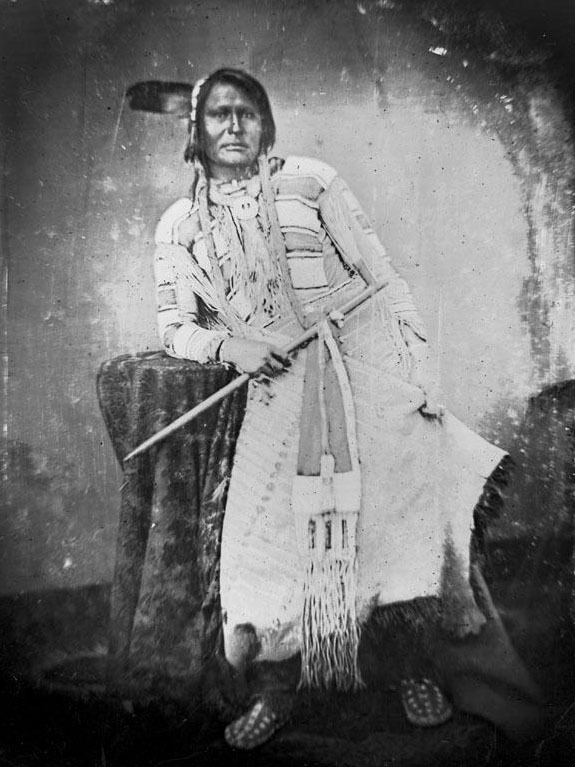 One of them is Little Chief, the Cheyenne chief of the 1851 delegation.